Dinosaur Comics - October 16th, 2017 - awesome fun times! –...Well, in my experience, anyway! October 16th, 2017: So it turns out that the LAKES INTERNATIONAL COMIC ART FESTIVAL was super fun. I even commissioned some art from one of my favourite English cartoonists! UPDATE: turns out Freaky Friday was originally a 1972 novel, retelling the same story first proposed (near as I can tell) in 1882. In our world, I mean. 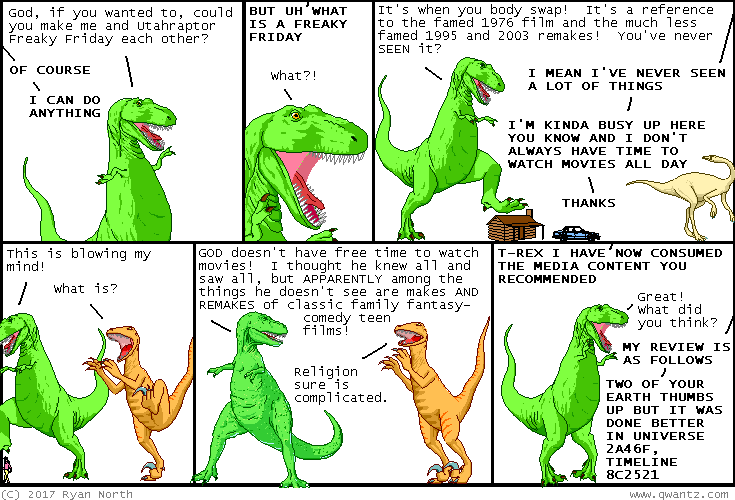 In dinosaur land it's exactly as shown in the comic and I have never made a mistake! !